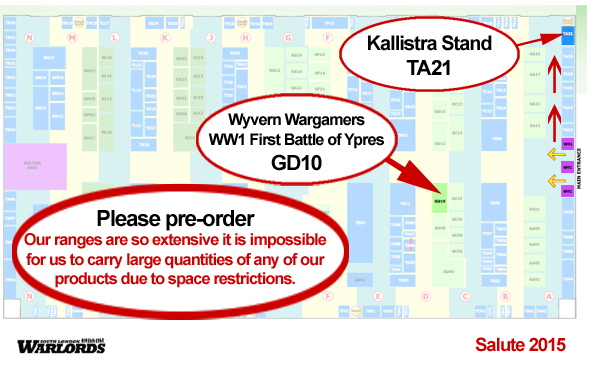 Salute 2015 is on Saturday 25th April at the Excel Exhibition centre in London. Please have your pre-orders to us by Monday 21st April. Kallistra will be at Salute, ExCel, London on 25th April stand TA21. You can use the webshop, e-mail or telephone your orders in advance. The chaps from Wyvern Wargames club will be staging a WW1 1914 First Battle of Ypres using the Raging Empires WW1 1914 Hex based rules. So come on over and take a look... you can join in too, if you like! I fully intend to get in another game of Raging Empires. Really enjoyed the game in Newark. I am now painting 4 battalions per side with supporting cavalry and arty.